Static cling happens when one piece of material sticks to another because of an accumulation of static electricity. This often results in clothing items sticking to each other. For instance, your dress may cling to your tights while you are wearing it. This can be embarrassing, but luckily there are simple ways to eliminate static electricity and keep your dress from clinging to your tights. Rub a clothes dryer sheet against the inside of your dress in a downward motion. Rub slowly in one direction. Rub the dryer sheet down the length of the tights in a slow downward motion. Carry a couple of dryer sheets in your purse so that you can combat static cling when you are out. Spray hairspray on the underside of your dress. Spray it evenly on all the areas of your dress that come in contact with your tights. Finish by spraying the areas of your tights that touch your dress. Pour one drop of hand lotion into the palm of your hand. Rub your hands against each other to distribute the lotion on both palms. Brush your palms down your tights in a slow motion. Run a wire coat hanger down the underside of your dress. 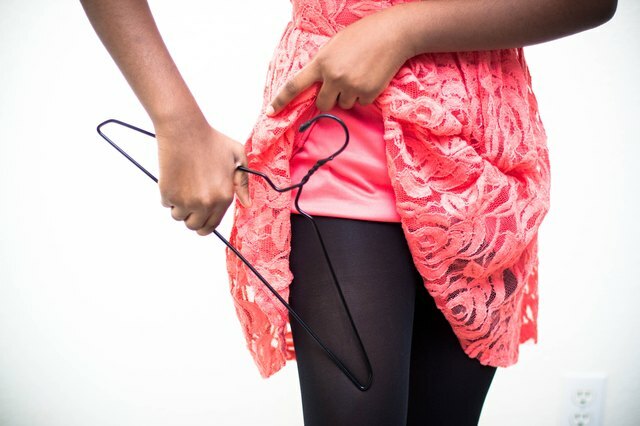 When you are finished, run the coat hanger down your tights in a slow motion. You can buy anti-static sprays at drugstores. Follow the directions for proper application to get rid of static cling.